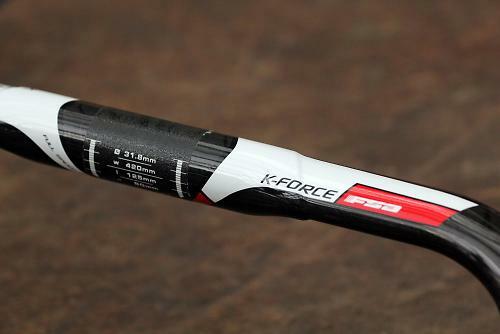 The FSA K-Force Compact, as the name suggests, has a shallower drop (125mm) than a lot of handlebars, including FSA's own Ergo bar. What that means is the transfer from the hoods to the drops is less extreme, and that makes it ideal for people who want who don't have the flexibility to ride in the deep drops of some handlebars. The reach (80mm) is also short with a good rearward extension of the drop. So as well as the shallow drop, the reach has been reduced, so you don't have to stretch quite so far. FSA have also given the drops a slight outward flare (4 degrees) that delivers good clearance between the wrist and top corner of the handlebar, so that you never bounce into the tops when you're riding in the drops. The shape of the handlebar makes it really useable, and we bet more people would make better use of the drops if they had a compact handlebar on their bike. I use the drops plenty when I'm riding, and almost exclusively when racing, especially crits, and I do much prefer the compacts as they offer enough aero advantage without challenging my lack of flexibiltiy to the same extent some deeper handlebars do. The K-Force Compact handlebar achieves its low weight thanks to a unidirectional carbon fibre construction, with Kevlar reinforcing. There's an extended wide section either side of the handlebar providing enough space for mounting a computer, out-front Garmin mount, lights or even clip-on aero bars. Fitting the bars was easy. There are cable grooves underneath the bar for the gear and brake cables to be routed, which provides a neat bar tape wrap. The key clamp areas are reinforced and with a textured material to prevent slippage. The only detail that niggles with me is the angled lip along the tops. It's clearly there to provide a flush fitting bar tape with the central bulge, but it looks unsightly if you prefer to finish your bar tape with a nice straight line. The K-Force Compact handlebars proved as stiff as any handlebars from 3T, PRO or Thomson, though perhaps displaying a hit more flex when really pushed hard, especially during out of the saddle sprints. Best of all is the comfort the shape provides. Here is a handlebar that you can comfortably ride in the drops for long durations, without suffering the sore back that deeper and shorter reach handlebars are more likely to induce. The only real downside, and it's a big one, is the massive price. Yes it's an expensive handlebar, but most carbon handlebars share the same criticism. You're paying for that lack of weight remember. Fortunately, FSA offers the same compact shape in the SL-K guise which is a more affordable carbon sibling, and then there is the Omega Compact handlebar which is just £35, with the same shape. So there you go. If you want a light handlebar the K-Force delivers, but if you fancy a compact handlebar, there are less expensive options. Three widths (40, 42 and 44cm) are available, measured centre-to-centre, all with a 31.8mm centre clamp diameter. You can choose from red or black colour options. It's light, but not the lightest; the same price 3T Tornova Team Carbon handlebar weighs 191g and spend a bit more and the Deda Superleggera Black Bar is just 180g. As well as the shape, which I absolutely love, the handlebar provides just a hint of flex that makes it really comfortable when bashing across rough roads. 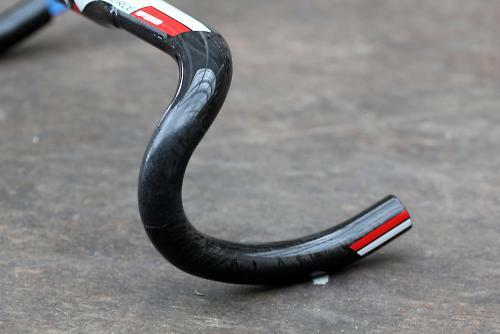 Brilliant performance for those who want a shallow drop handlebar. The drop and reach is really agreeable, and it looks good too. Nice weight as well. The angled bulge on the tops that doesn't align with the bar tape. An expensive, but lightweight, stiff and comfortable handlebar that has a really nice shape. And looks great too. The cheapest FSA compact bar is currently for sale at £20 and weighs 100 grammes more than this bar. I make that £2.35 per gramme saved, which is a bit pricey for something covered in bar tape. It's the kind of thing you'll have to tell people you've bought, or they'll never even know. I would be greatful if future reviews of bars also showed the brifters attached (photo ideally from the side). I bought the prior version of this K-Force compact bar and was gutted to find the curvature was not tight enough at the top to ensure a flat transition from bar to brifter. I know in the past it was always the way to have the brakes at an angle to the bar, but some bar manufacturers have updated their designs to match brifter design, allowing a flat transition if you wish. I would be grateful if future comments on reviews of bars refrained from using the word 'brifter'. The correct term is 'Grake Shever'. Thank you. Build up the hollow bit of the transition between bar and hood with a bit if off cut bar tape before you wrap it. Silly price! I'd expect well under 200g for that money. for £80 you can get a decent FSA alloy wing pro bar weighing just 50g more. Is it just me, or does anyone else think that spending £254.99 on a handlebar is tending towards the obscene? Properly elite riders might have an excuse but the rest... give more money to charity! Silly price indeed - I wouldn't expect under 200g for that, oh no I'd expect over 600g i.e. at least 3 pairs of bars not just one. Yes it can be argued that spending that amount on bars might be tending towards the obscene. Sadly we live in a society where such spending is seen as a sign of success, as a status symbol etc. and there are many who will of course reply with the "well if people can afford it why shouldn't they" type of argument. Well for the last few years I've been working in cycling at a grass roots and community level and it seems to me that the drive by manufacturers towards incredibly clever but also incredibly expensive kit is excluding many people from enjoying what ought to be a fairly simple and healthy activity that is also affordable. For the cost of these bars I know of several organisations locally that could fit out a small family with recycled bikes good enough to last for years. I worry that as the top end price increases so will the lower end pricing and that ultimately excludes people and maintains the impressions that cycling is not and everyday normal activity for everyone. That is sad! I wouldn't want Halfords car mats in a Ferrari. the drive by manufacturers towards incredibly clever but also incredibly expensive kit is excluding many people from enjoying what ought to be a fairly simple and healthy activity that is also affordable. This is nonsense. The fact that expensive kit is available doesn't mean that more affordable and enjoyable kit isn't available. Or are you equating 'enjoyment' with 'expensive kit'? It's rather like decrying a DuraAce Di2 setup because it's not Tiagra. The Tiagra still works if that's where your limit lies. Just because you are limited to Tiagra (or whatever) does not make cycling unenjoyable, and at the same time should not restrict others from attaining DADi2. Not that I personally aspire to that, but there you go. I worry that as the top end price increases so will the lower end pricing and that ultimately excludes people and maintains the impressions that cycling is not and everyday normal activity for everyone. That is sad! I agree that it would be sad if it were realistic.